This fun and fuzzy five-inch puff is actually a unique electronic sensor that controls a lamp's light levels with just a gentle tap. 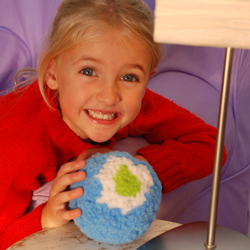 Made 100% of textiles, the ElectroPUFF is irresistibly soft and fun to use. Kids will love their whimsical style and vibrant colors - while adventurous adults will appreciate their innovative technology. Watch our video to see how easy it is to use!